This week's challenge builds upon Ben's work. First, you'll need this version of Superstore (which is different to Ben's but the same one I normally use for WW). 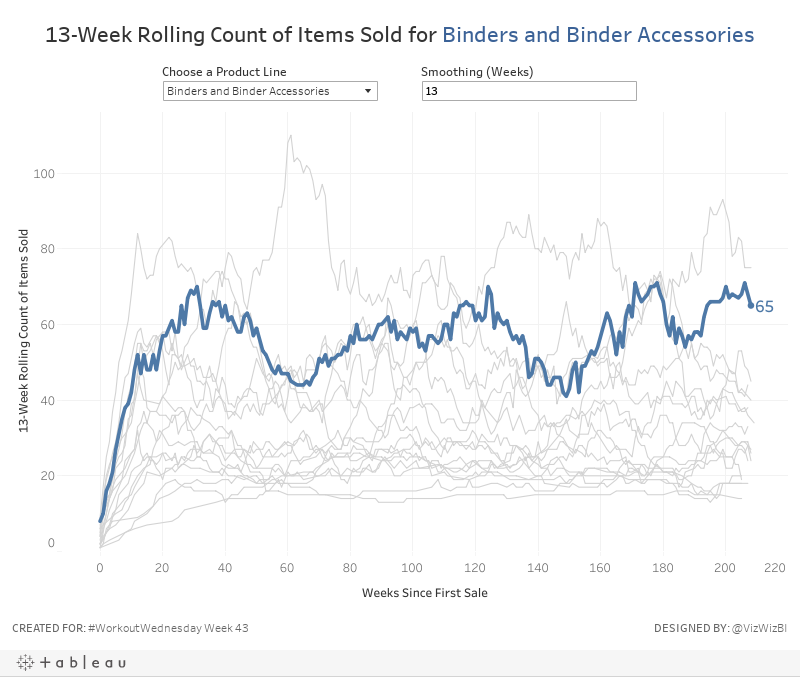 Create a line chart of the rolling N week cumulative products sold since the first week each product sub-category was sold. In this case, a product sold is the count of the product names. Allow the user to pick a sub-category to highlight. Make it blue and all others grey. The sub-category highlighted should also be slightly thicker than all other sub-categories. Allow the user to define the number of weeks over which to compute the smoothing. The user should only be able to enter values between 8 and 52. The title and the y-axis should update dynamically based on the number of weeks entered for the smoothing. That's it! Nothing overly complicated this week. Good practice for calculations though! Enjoy! Hi Andy. Is it possible to automatically highlight the line by clicking on it? So when I click on the line, it will be automatically selected in the parameter and highlighted. You can highlight the whole line when you click on it with a highlight action. Set the action to highlight itself based on the dimension of the line. But it won’t automatically put that in the parameter.